Oils that contain less than 4 grams of saturated fat are considered healthy oils. According to the American Heart Association, cooking oil is considered healthy only if it contains monounsaturated and polyunsaturated fats. These fats are found in vegetable oils rather than butter, or lard. Even tropical oils such as coconut or palm oil can be harmful as they contain saturated fat. Vegetable oils such as canola, olive, soybean, sunflower, corn, and peanut are all considered healthy. Let’s take a quick look at two of the healthiest cooking oils. As the name suggests, this healthy cooking oil is extracted from sunflower seeds. It is a rich source of vitamin E. It is for this reason that sunflower oil is popularly used in beauty products. Another great reason for using this oil is that it has a high boiling point. That means that it can hold its nutrients for a long period. It would a great alternative to use to fry dishes. However, use of sunflower oil may affect diabetes levels. 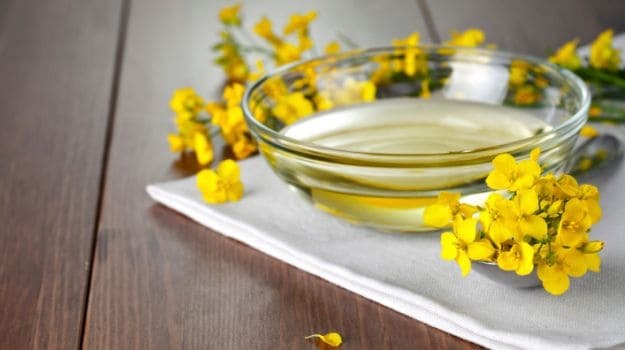 Canola oil is extracted from crushed seeds of the canola plant. It contains the least amount of saturated fat of all cooking oils. It is a rich source of Omega 3. This oil works very well for frying or baking dishes. However, each of oils on the market varies in the concentration of vitamins and minerals. Some oils can be really pricey. Each oil has a distinct flavour. It would be wise to be selective about which of these oils you consider for cooking. Also remember that too much of anything can be bad for your health. Even though these oils are healthy, overusing them may cause unnecessary weight gain.